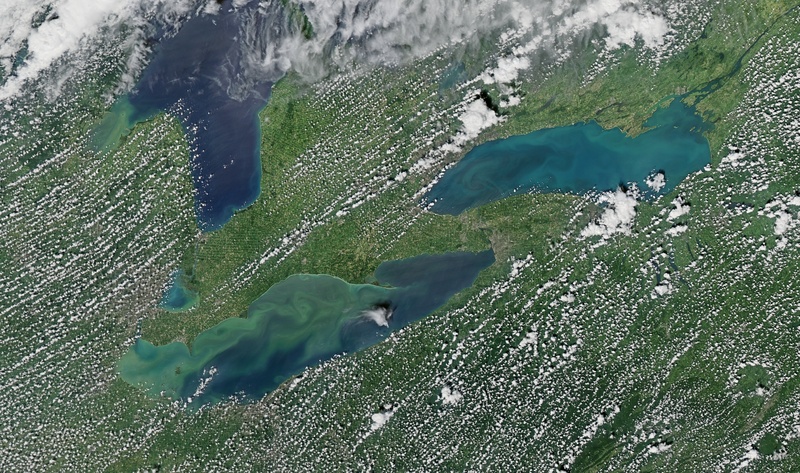 Satellite radiometers measure the apparent optical properties of water bodies like the North American lakes, Erie and Ontario. For example, in this September 5, 2018 view from Aqua/MODIS, Lake Erie (lower left) appears more green in the west and bluer in the east while Lake Ontario (upper right) looks bluer in the west and more turquoise in the east. These appearances result from the inherent optical properties of the water in the lakes; in other words, water molecules and the living and non-living particles suspended in them absorb and scatter the different wavelengths of sunlight in characteristic ways. The job of the ocean-color (or lake-color) scientist is to figure out which molecules and particles are absorbing and scattering the incoming photons so that she can learn something about the ecology (or geology or fluid mechanics) of the region.